To experience Bruegel’s paintings in the original, in the midst of life, is to be jostled by a crowd. Mass audiences obscure the aura of many famous masterpieces, turning them into sideshows in the carnival of cultural display. 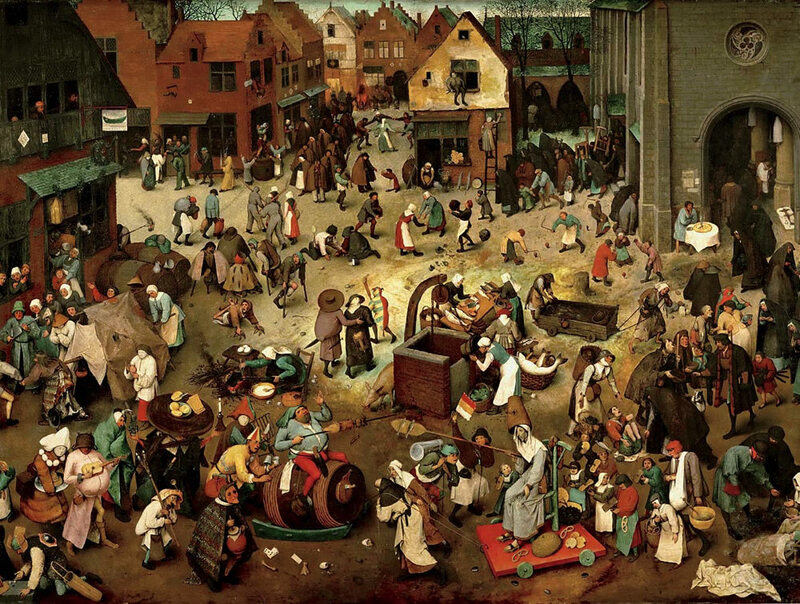 Bruegel, by contrast, makes crowds seem a cheerful extension of his art. Not only are his paintings packed with people—with revelers, with children, with entire armies of the living and the dead—these teeming masses behave like proper crowds. Some cluster in groups that act in unison, dancing, marching, feasting, fighting, building, and playing, while others stand a bit apart and observe the goings-on passively, as would an audience. And when people in Bruegel’s paintings play the role of spectator—when they peer curiously through windows and pour through doorways to glimpse some street theater performed outside; when they stare, confused, at the fallen Saul at his moment of conversion to the Apostle Paul; when they, grown-ups and children alike, on horseback and on foot, hurry toward Golgotha to reserve a good spot to witness Christ’s Crucifixion; and, most of all, when they turn from the diversions that have captured them in the picture to gape directly out at us gaping curiously back at them—their painted world gathers us, ourselves people in a crowd, into their inner fold. In Vienna, as in the museums in Berlin, New York, Madrid, Antwerp, and Detroit where the other major Bruegels hang, one can spot this artist’s paintings from far off simply by the large and lingering audience they inevitably draw. A supreme portraitist of crowd behavior, Bruegel cleverly reflects and stage-manages his own mass appeal. This is surprising. With his printed images—published in large editions and sold on the open market—he banked on a large viewership. But with his paintings, he addressed a select few. Only the most affluent burghers of the super-rich towns of Antwerp and Brussels could commission and behold the paintings we now admire.